Saint Francis de Sales church, built at the turn of the last century, is known to locals as the "Cathedral of South St. Louis" because of its elegantly-designed exterior and over 300-foot long spire. The church building is in an imposing Gothic revival style. The High Altar alone is more than 50 feet high and forms a unique throne for Christ the King, present in the ornate Tabernacle under the species of the consecrated host. This church is the ideal setting for the sacred solemn liturgy, and its adjacent buildings seem to be made for the needs of our continuously growing community. This church is the only church in the St. Louis area of German Gothic architecture and is based on the design of the Ulm Minster located in Ulm, Germany, the tallest church in the world. Saint Francis de Sales has been an anchor in its neighborhood since the founding of the parish after the end of the Civil War in 1867. The campus includes the church, a rectory, convent, and two school buildings. The church is on the National Registry of Historic Places. St. Louis, the Rome of the West, has long been known as a focal point of genuine Catholic life in this country. Steadfast faithfulness to Holy Mother Church and the Roman Pontiff, filial devotion toward Our Lady, and a deep Eucharistic piety are the characteristics of this city. The buff-colored exterior features large, pointed arched windows, decorative columns and ornate trim. 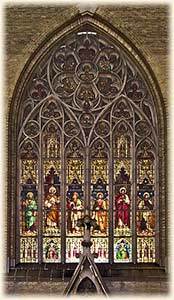 In the tradition of the European Gothic churches, Saint Francis de Sales is adorned with a magnificent array of stained glass windows. The church has a 130-foot long nave, one of the longest of the churches in St. Louis, and its beautiful interior and solemn liturgy has made it apt for the worship of God. The church has four bells including one from the original church. Gothic or pointed arches used inside the building create tall, open spaces and directs the eye skyward giving the interior a grand appearance. The interior features multiple apses, and richly carved wood, statues and details. The design of the church interior was based on those of German hall churches with ceilings over the side naves almost as high as those over the main nave increasing the open feeling and spaciousness. The High Altar and the reredos, the ornate screen behind the altar, are in a large apse. Smaller apses on the sides of the main apse feature altars to the Blessed Mother and to Saint Joseph. The transept projects to both sides of the central nave, features altars to Our Mother of Perpetual Help in the North, and the Infant of Prague in the South. The Baptistery features Byzantine-style glittering mosaics. The work was done by the same artists who worked on the mosaics in the new Cathedral Basilica of Saint Louis. Lapis lazuli stone from Persia was used for the blue sky mosaic in the vaulted ceiling. 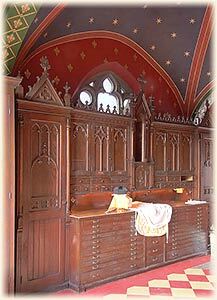 The reredos, altars, pulpit, communion rail, pews and confessionals in the church are of carved wood. The 52-foot high reredos features a series of pinnacles with niches depicting different scenes and is framed by carvings of angels. It was made by E. Hackner Co. of La Crosse, Wisconsin. The church's stained glass windows were created by Emil Frei, Sr., considered to be St. Louis' premier stained glass artist. Frei and his wife had emigrated to San Francisco from Germany but were so homesick for the Old Country, they decided to return there. On their way across the country, they stopped in St. Louis to visit some German friends. They were so taken by the German community of South St. Louis, that they stayed. Emil Frei, who had studied at the Munich School of Arts and Crafts, went on to design the stained glass windows of several St. Louis churches. Also in the church are statues of Saint Francis de Sales, Saint Nicholas, Saint Henry, Saint Teresa, Saint Catherine, Saint Teresa of Avila, Saint Aloysius, Saint Ann, Saint Anthony and Saint Francis of Assisi. The altar of the Infant Jesus includes statues of the holy deacons Saint Lawrence and Saint Stephen. The altar of the Blessed Mother features statues of Saint Rose and Saint Cecilia. 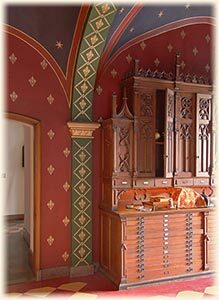 The elaborate interior frescoes were painted by Fridolin Fuchs, another German immigrant. Fuchs said he based his ceiling frescoes on the artwork in the Gothic churches of Germany. Clock faces were added to the steeple following the 1917 anniversary celebration. A shrine to Our Lady of Lourdes is on the front lawn of the Oratory. Saint Francis de Sales parish was formed in 1867 by seven German immigrant dairymen who had been members of Saints Peter and Paul parish, located at Eighth and Allen streets in nearby Soulard. At the time, the area west of Jefferson was not very populated, and the seven German dairymen purchased a tract of land at Gravois and Ohio with plans to build a new church. Plans were made to build a new brick church at a cost of $12,850, a large amount in those days. The church was named in honor of Saint Francis de Sales, a French missionary who worked in the Chablais region near Geneva to bring back those lost to Calvinism. He is credited with bringing back over 72,000 calvinists to the Church. He later became bishop of Geneva and was canonized a saint by Holy Mother Church in 1665. Francis died at Lyons on December 28th, 1622 and was buried at Annecy on the following January 24th. He was declared a Doctor of the Church in 1877 and Patron of the Press in 1923. A cornerstone-laying ceremony held September 15, 1867 was marred when a stand collapsed. No one was seriously injured, but it was determined that vandals had sawed some of the timbers supporting the stand the night before. The first Holy Mass was celebrated at the church on Christmas 1867 while the building was still under construction. Three babies were baptized that morning. On May 24th of the next year, the church was dedicated. A census revealed that St. Francis parish already had 800 members. The parish quickly grew and in 1869, a school was opened. The parish's second pastor, a recent arrival from Germany, purchased property adjacent to the church where a three-story school, including a residence for the nuns, was constructed in 1872. The St. Francis de Sales Benevolent Society, which was launched on April 19th in 1874, still opperates today. Several other parish organizations were also formed during these years including the Saint Vincent de Paul Society, in the winters of 1884 and 1885. In 1883, the parish’s third pastor, Father John Peter Lotz, enlarged the church by adding a new sanctuary and bell tower. Five years later, he built another three-story school. In 1894, Father Lotz began to make plans to build a new church. He traveled to Berlin to consult with German architect E. Seiberts and came back with plans for a grand church of cut stone with a 350-foot center spire, two large supporting towers, two smaller towers over the transepts, two additional spires and elaborate finials. But it soon became clear the cost of so elaborate a building would be far more than the $135,000 earmarked by the parish's building committee. After excavation on the basement began, it was decided that the cost of so grand a church was beyond the means of the parishioners. Parish leaders decided to finish the basement, put a roof on it and use it as a church until a final decision could be made on what to do about proceeding with plans for the new building. Before the basement of the new church could be completed, the devastating tornado of 1896 destroyed the original church. Over 300 persons from South Saint Louis City died in that storm. A few years later Father Lotz died, and a year after the arrival of his successor, Father Frederick G. Holweck, plans were underway to build the new church but with some changes. Instead of cut stone, the church would be of brick and terra cotta; the transept towers and twin steeples were eliminated and the exterior trim streamlined. A 12-foot iron cross weighing 900 pounds topped the 300-foot tall steeple. In 1952, the rusting cross was replaced by an 18-foot cross covered in gold leaf. By early 1907, construction on the new church had begun. It was dedicated on November 26th, 1908. Even with the changes, the building had a grand, elaborate look to it. A year after the church was dedicated, an article in the parish newsletter proclaimed, that the portal of the front entrance is an exact copy of the famous Gothic portal of the Cathedral of Munich. After construction was completed, Fridolin Fuchs, a German immigrant, was hired to paint the interior frescos, and a Benedictine Monk from Arkansas did the drawings for the two large paintings in the churchs transept. By 1917 when the parish celebrated its Golden Jubilee, it had grown into one of the largest in the city. Twenty years later plans were made to build a new grade school and open a parish high school. During the 1930 growth years, it became popular to refer to St. Francis de Sales church as the "Cathedral of South Saint Louis." For many years the parish reflected its German heritage in its daily life. The German language was used for the sermons at Holy Mass, the classes at the school, and upto the late 1930s, half of the parish's publications. In 1939, after razing the boys school built in 1872, a new school was built. Plans were also underway to establish a high school as there was a shortage of Catholic high schools in Saint Louis. In the fall of 1939, a junior high school was established and later it was expanded to include a high school. The first class graduated in 1947. In 1964, an elevator was installed at the church's Lynch Street entrance to accommodate parishioners. At that time only two other churches in St. Louis had elevators. In 1966, as the parish's 100th anniversary approached, a restoration of the building was undertaken, and two years later St. Francis de Sales was named one of the 62 significant historic buildings and sites in Saint Louis by the local chapter of the American Institute of Architects. As suburbs developed and the population shifted away from the city neighborhoods, the parish's numbers began to decline. In 1973, the elementary school was consolidated with three others, and St. Francis de Sales High School closed in 1974. And as urban blight became an issue for the neighborhood, a Parish Community Development Office was opened the next year. It evolved into the DeSales Housing Corporation, and the parish became a center for many social service agencies. The DeSales Community Housing Corporation, now independent, has spearheaded improvements in the area. As the parish celebrated its 125th anniversary, it continued to serve parishioners of more than a dozen nationalities. In 1990 a church preservation fund was established to raise funds to maintain the church building. As population shifts continued through the 1980s and 1990s, St. Francis de Sales parish served a Hispanic population until 2005. In June of 2005 St. Francis de Sales "parish" was closed by the Archdiocese of St. Louis and was consolidated with another neighborhood parish. The church building and campus were scheduled to be torn down and sold. In July 2005, the church building, and campus was given to the Institute of Christ the King Sovereign Priest to maintain and administer the sacraments according to the 1962 Roman Missal. The then Archbishop of St. Louis and now Cardinal, His Eminence, Raymond Leo Cardinal Burke, erected the church as an Oratory of the Institute of Christ the King Sovereign Priest. Today, St. Francis de Sales Oratory serves the entire archdiocese of St. Louis and is the center of the Extraordinary Form of the Roman Rite. 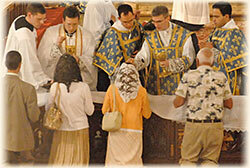 In January 2005, the Institute of Christ the King Sovereign Priest became a part of the great Catholic tradition of St. Louis. His Eminence, Raymond Leo Cardinal Burke, Archbishop Emeritus of St. Louis, and friend of the Institute, called our community to serve God with the Roman Rite of 1962 first at St. Agatha parish, and since July 2005, in the magnificent "Cathedral of South St. Louis", St. Francis de Sales. To learn about the Institute of Christ the King, see "Who We Are". Currently the Institute is raising the necessary funds to restore the magnificent church building entrusted to our care. Since 2005, the entire roof has been repaired and restored. After a heat-loss study, it was determined that all the stained-glass windows would have to be restored to keep some of the 40% of heat that is normally lost through them. The façade of the whole building needs to be tuckpointed to stop the seepage of water into the walls. The organ and the frescos need to be cleaned and restored. The entire electrical system dates from the beginning of the 20th century and needs to be replaced. Besides these, other renovations are also needed to maintain the church's grandeur as a place of worship and inspiration. 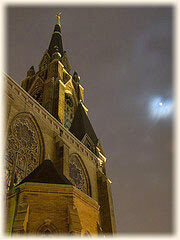 The Cathedral of South Saint Louis is located at the corner of Gravois, Ohio and Lynch Streets. It is easily accessible by highways I-44, I-55 and I-64. From downtown St. Louis, take Tucker (12th Street) a few miles south to Gravois at Ohio and turn right on Ohio. The church will be immediately on the left. The church building is handicap-accessible.